The Aligarh Muslim University (AMU), one of the oldest and famous seats of learning in Asia, today celebrated the ‘Sir Syed Day’, 198th birth anniversary of AMU founder Sir Syed Ahmad Khan.While delivering his address on the Sir Syed Day Commemoration Ceremony, the Chief Guest, Mr P K Abdu Rabb, Minister for Education and Culture, Government of Kerala pointed out that the educational and cultural institutions at Aligarh bloomed in the 19th century India under the leadership of the legend Sir Syed Ahmad Khan.He added that AMU’s services have not been restricted to the suburbs of the river Ganges, but it is creating ripples across the country.Mr Rabb further said that before Sir Syed started his movement, the Muslim youths were looked askance at under the modern education system in addition to the prevailed waves of naturalism. “Truly speaking before the Sir Syed’s movement, the annihilation of the community had touched rock bottom,” said Mr Rabb who added that Sir Syed later diagnosed the diseases of the community such as superstition, illiteracy, poverty, etc and he felt that modern education and enlightment was the panacea for getting rid of all these ailments.Mr Rabb pointed out that when Sir Syed learned that out of 1862 graduates from Calcutta University in 1872, the number of Muslim graduates was a meager 57. “Sir Syed realized that it was the orthodox belief that left Muslims far behind,” he further said.Mr Rabb lamented that Sir Syed started the publication of ‘Tehzeeb ul Akhlaq’ intending to make the community realize the importance of English education. “The institution of scientific society established by Sir Syed was a milestone in the history of Aligarh Movement as the society was formed aiming at translating science books into Urdu language. “Sir Syed traveled to England for understanding the working of Oxford and Cambridge Universities and returned home to see a role model institution in Aligarh,” said Mr Rabb. He added that Sir Syed’s intention was to blend Western Science and literature with Eastern education.Mr Rabb said that while traveling to various cities and remote villages of India to raise funds, Sir Syed once stated that his face has become like an empty vessel of a silent beggar but he was begging for the better of people. 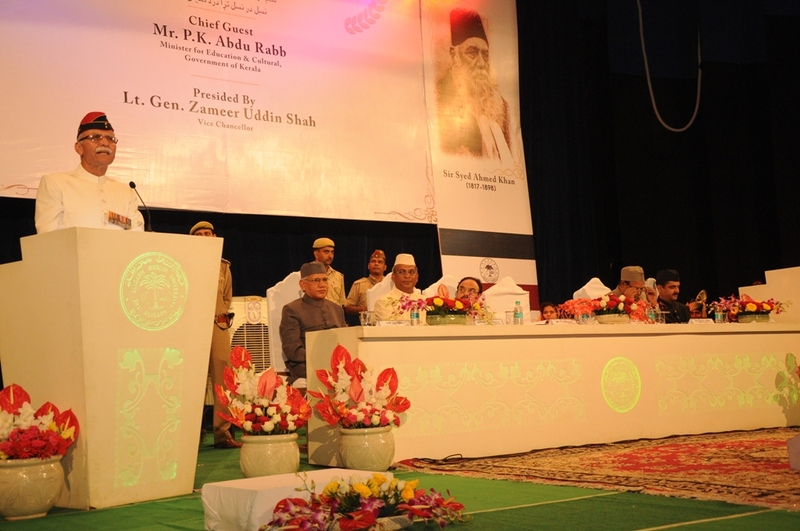 “With these struggles, Sir Syed first established the Madrassathul Uloom in Aligarh in 1875, which later became the Mohammadan Anglo Oriental College in 1877,” said Mr Rabb.While concluding his address, Mr Rabb said that the Aligarh Movement still continues to serve the cause of Muslim Education and the seed sown by Sir Syed Ahmed Khan expanded in a big tree. AMU Vice Chancellor, Lt General Zameer Uddin Shah (retd) further pointed out that recently, Professor Javed Massarat, Dean, Faculty of Agricultural Sciences has been appointed as the Vice Chancellor of Baba Ghulam Shah Badshah University in Rajouri, Jammu and Kashmir. He also said that AMU Faculty members, Prof Faizan Mustafa and Professor Akhtar Haseeb are the serving vice chancellors of NALSAR University of Hyderabad and Agricultural University of Faizabad respectively.He further informed that gathering that Phd output of Aligarh Muslim University has tripled in the past three years, which points out to the high standards of academic research in the university. AMU Vice Chancellor, Lt General Zameer Uddin Shah (retd) also said that the work of a news girls hostel, Olympic size swimming pool, management complex, and a new road in the Tar Bungalow is in progress and will complete shortly. 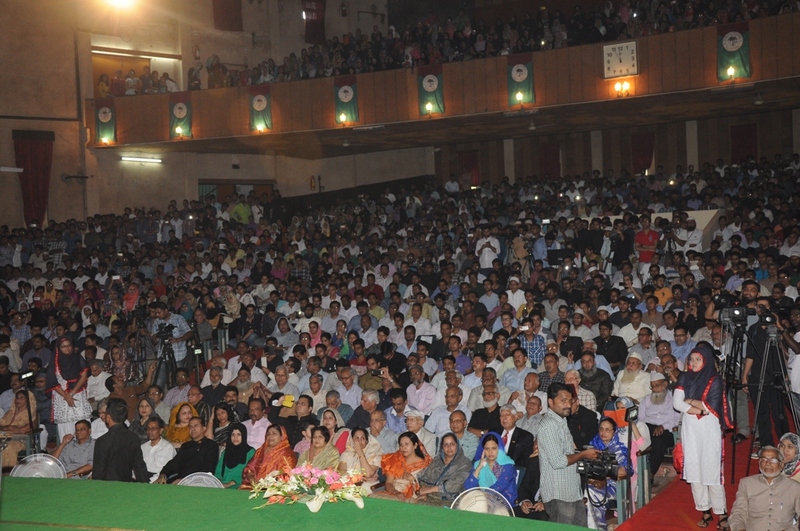 He also announced that the AMU Convocation will take place on February 27, 2015.Professor Roomana N Siddiqui, Department of Psychology said that Sir Syed Ahmad Khan foresaw the imperative need for the Muslims to acquire knowledge in the English language and modern sciences to maintain social and political identity. “He began to prepare the road map for the formation of a Muslim University by starting various schools. He instituted Scientific Society in 1863 to create a scientific temperament among the Muslims and to make the Western knowledge available to Indians in their own language,” further said Prof Siddiqui. Dr Mohibul Haq, Department of Political Science said that history of social and educational reforms in Indian sub-continent can not be completed without Sir Syed Ahmad Khan.“Sir Syed is one of the great thinkers, philosophers and revolutionaries who had dedicated their complete life for the betterment of the community,” said Dr Haq adding that the 19th century was a hard time for the nation of India and especially for Muslims in the aftermath of 1857 revolt against British colonialism, Sir Syed in this period motivated and guided Indian Muslims in the right direction. AMU students Ms Varda Arif and Mr Abdur Raqeeb of BSC and BA courses respectively in their speeches spoke about Sir Syed’s greatness as an ardent reformer, who wanted to reconcile modern scientific thought with religion by rationalistic interpretations.During the Commemoration Ceremony, the Chief Guest, Mr P K Abdu Rabb awarded Professor Rizwan Hasan Khan, Coordinator, Institute of Interdisciplinary Bio-Technology Unit with the ‘Outstanding Researcher of the Year 2015-16’ award for contribution in the field of Science. The award carries a cash prize of Rs One lac with a citation. The first and the third position holders of ‘All-India Sir Syed Memorial Essay Competition’, Ms Alvira Siddiqui of AMU received a cash prize of Rs 25, 000 and Mr Noor Uddin Mustafa of Calicut received a cash prize of Rs 10, 000 respectively. The winners were awarded by the Chief Guest. Meanwhile, the winners of various competition organized by the Cultural Educational Centre were also awarded in the function. Prof Anis Ismail, Dean Students Welfare proposed the vote of thanks while the Dr F S Sheerani and Dr Faiza Abbasi conducted the program.Earlier in the day, a Quran Qwani (Quran recitation) was conducted at the University Jama Masjid and AMU Vice Chancellor, Lt General Zameer Uddin Shah (retd) paid tributes to Sir Syed’s grave by placing a new cloth and flowers on it. While inaugurating an exhibition on Sir Syed’s writings and books at the Sir Syed Academy, the AMU Vice Chancellor, Lt General Zameer Uddin Shah (retd) and Brigadier Iqbal M Shafi, the oldest ‘AMU Old Boy’ from Islamabad, Pakistan also released three books. The released books are ‘Sir Syed on Education and Tolerance’ by Latif Hussain Shah Kazmi, ‘An Autobiography of my dreams’ by HSA Yahya and ‘Catalogue of Sir Syed’s Collection in Musa DAkri Museaum by Prof Ali Athar.